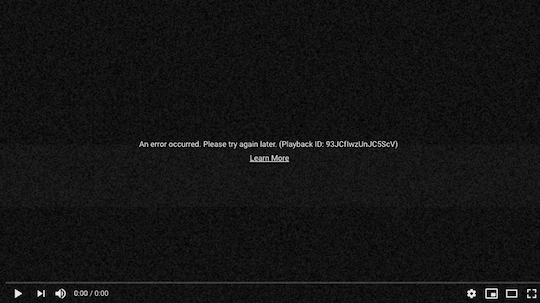 “We’re working on resolving this and will let you know once fixed,” says a Team YouTube tweet. The website appeared to be working, but once users clicked on a video, they were delivered an error message. The blackout lasted a little more than 90 minutes. Serious downtime for the platform is – like on other Google-owned platforms – pretty rare, The Verge’s Sam Byford points out. During the World Cup, YouTube TV did experience some difficulties, Channel pages went down for a while in April, and a decade ago the platform did crash for hours after a Pakistan ISP that was ordered to censor YouTube accidentally managed to take down the entire site.